We recently received this print in the mail from a family member of an alumna from the class of 1909. 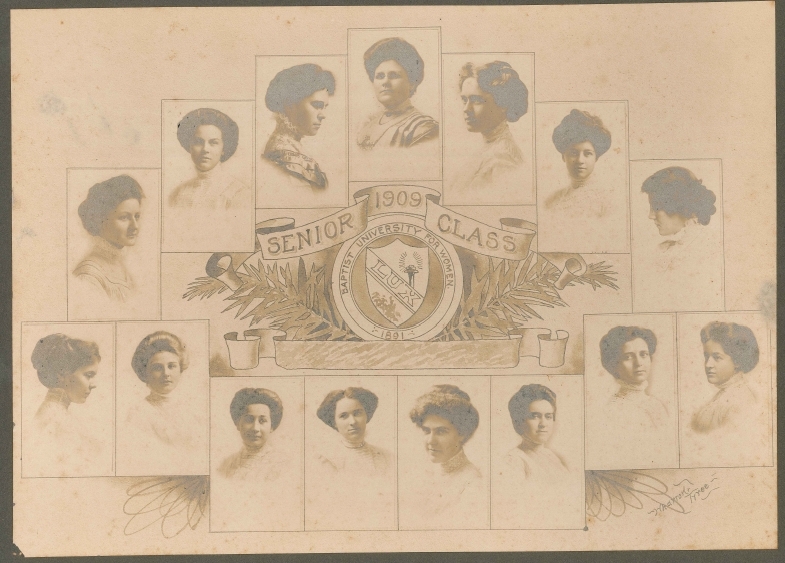 This collage, depicting all of graduates from the Baptist University for Women class of 1909, was found while cleaning out some of the alumna’s belongings. Many thanks to their family for giving us this amazing piece of Meredith College history. Do you have any pieces of Meredith’s history that you no longer want or need? Old annuals, copies of The Twig, photos from your time in college, etc… are all more than welcome! If you’d like to send us some of your old memorabilia, just contact us at alumnae@meredith.edu and we will pass the items along to the archives department. High School Visitation Day – This Saturday! what a gorgeous photo of one of our first classes to graduate! thanks so much for sharing this.